Our dog and cat lodging is perfect for pets of all shapes and sizes including multiple dogs from the same household! Our family suites for multiple dogs are huge! We have a beautiful facility that focuses on a low stress environment, a home away from home feel where the pets get the individualized attention and care that they would receive at home - possibly even more! 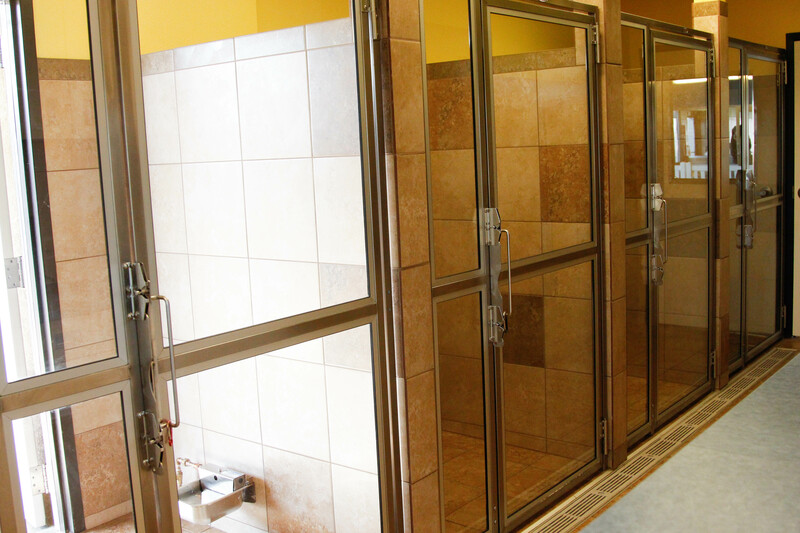 Our dog suites are individual rooms with a full height door that accesses a large exercise yard where pets get played with and get to romp off leash safely. Webcam dog lodging suites are available so you can keep an eye on your fur kiddo while you're away. Webcam access (through a mobile app) will allow you to see your dog's suite, daycare indoors and out, and the pool! Our Day Lodging option is perfect for when you have to work a long day, your house is being remodeled, or you just got a new puppy, and your dog is not social with other dogs. With Day Lodging, your pet can stay in one of our luxury lodging suites, with access to our fenced in outdoor area, giving you peace of mind that they are well taken care of. Our yard is partially covered for poor weather and those pooches that don't like to get their feet wet! On the other hand, the ones who love water can splash in our indoor, in ground dog pool for extra fun and exercise! Our suites have natural light from windows and have automatic waterers and specialized beds for lounging. We can individualize your pet's stay with activities that they prefer and will work with you to handle any special requests for feeding, medications, exercise or attention. Our kitty condos feature multiple levels, fun climbing shelves and hide away litter boxes for privacy. Our kitties are housed on our mezzanine, with glass walls, overlooking our indoor pool - they will truly feel like they are on vacation with all the sun and fun they get to witness! More LODGING INFORMATION in printable format. Special Attention Time: $9 for 20 min. We require a deposit of 50% of the cost of your pets stay at the time you make the reservation. You are charged for the day you drop off regardless of the time. Pets checked out before noon will not be charged for the day they leave. On Sundays or holidays, pets that check out before 2 PM will not be charged for the day they leave. Pets checked out after noon will be charged for a full day of lodging unless they opt to stay in daycare for a full day at an additional $11 charge. This option is not available on Sundays or holidays. Cancellations are required two weeks prior to the start of a peak season time lodging reservation or 48 hours prior to the start of a non-peak season lodging reservation. After hours, you must drop off or pick up your dog at the Dog Tales door at the back of the building. Ring the doorbell and we will be with you as soon as we can. Payments are not accepted during our after hours times. For your convenience, we will put a card on file for your stay and post your charges on the last business day of your stay. Rabies, Distemper/Parvo (DA2PP) and Bordetella are required. Please let us know who your veterinarian is and we will call to confirm required vaccinations. Current titers will be acceptable in lieu of vaccinations, as well as vaccination exemptions per your veterinarian. Rabies and FVRCP are required. Current titers will be acceptable in lieu of vaccinations, as well as vaccination exceptions per your veterinarian. We can feed your pet our Royal Canin diet, or you may bring your pet’s own food in with you. Food must be in a re-sealable, water-proof container. Ziploc bags, plastic containers, etc. are all accepted. Paper bags or plastic grocery bags are not accepted. We will provide a plush mat for your pet to sleep on, but feel free to bring whatever you feel will make your pet’s stay more comfortable. Remember, some items may get chewed up. Beds should be able to fit in a standard sized washer and dryer. We can medicate your pet if needed. Prescription medications must be in the original package or bottle and have the prescription label showing the proper dosage and frequency of administration. There is a $6 per day fee for medicating your pet. Ziploc bags of prescription medication, pre-filled pill pockets or prescription medication mixed in with food will not be accepted. We will use pill pockets if provided by you or purchased here at the hospital. Grooming: Performed by our veterinary team on request. 10% off for cats lodging with us. We require the following vaccines to be up to date: Rabies, Distemper, Parvo and Bordetella (must have been given in the last 6 months). We also require you to fill out our New Client Form, our Dog Tales Activity Consent Form, our Daycare Questionnaire (if your dog is participating in Daycare for the first time), and our Splash Orientation Questionnaire and Pool Rules (if your dog is participating in Splash for the first time); all available on this website. Please call us to schedule a reservation or email us to inquire at hospital@aacofco.com.